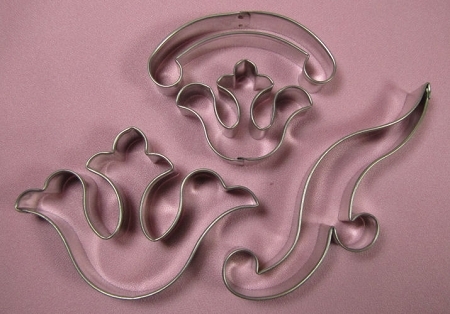 Arabesque Scroll Cutters Set of 4 by Edith De La Flor. The Largest design measures 4" x 3", the Smaller design measures 1 1/2" x 2 1/4". The long scroll measures 5" x 1 1/2" and the smaller scroll measures 3 1/4" x 1 1/2".